Posted November 16th, 2018 by Mobile Music School & filed under Educational - How to Guides. 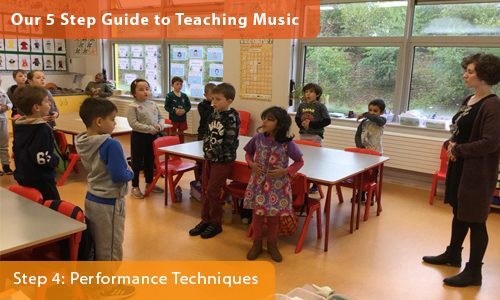 This week as part of our 5 step guide to teaching music education, we will be taking an inside look into a typical day in one of our Music in the Classroom programmes to see how our professional music tutors teach performance techniques to the children in 1st class. Last week we looked at effective music practice, let’s see this week if practice really does make perfect! After all their practice, our 1st class students are ready to perform. Our music tutors teach students performance techniques such as how to carry themselves on stage, project their voice and sing together as an ensemble. With the encouraging support of their music tutor, the students were confident enough to perform their piece in front of the whole school! And as Gaeilge too! Here at the Mobile Music School, we have found that a child-centred approach to music education makes them feel comfortable and confident when performing in front of an audience. Our 5 Step Guide to Teaching Music Education – Step 5: How to Warm-down coming next week!